Lars Andersson’s collections are a bit atypical for Fashion Week. 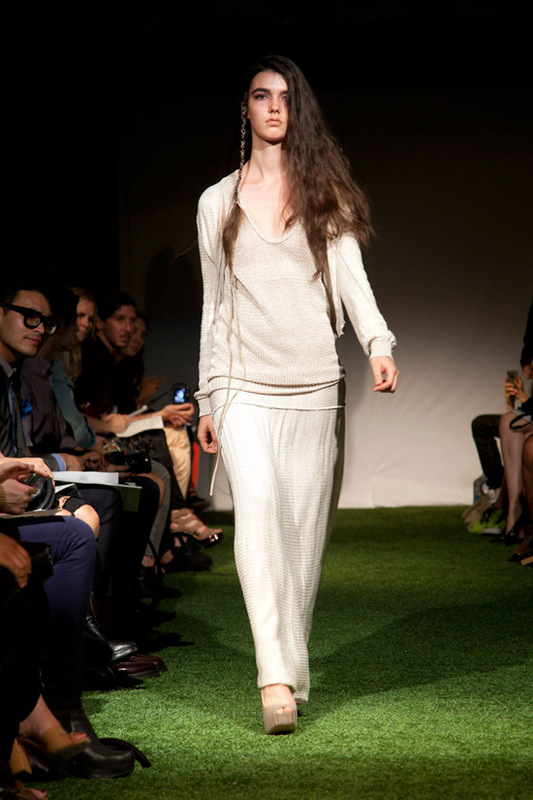 He only does knits–beautiful knits, but only knits. So it’s a bit of a testament then that he’s still showing despite only ever showing knits. His lines have been almost exclusively dark since he started out, but this season he went a different, beiger route, thanks to a chick at a Diiv concert. “…she had bleached blonde hair and this floor length white lace shawl, and I said, ‘that’s my girl.’ She’s like Stevie Nicks, Courtney Love,” said LArs backstage after the show (and after he’d moved elatedly around The Yard, asking friends if it wasn’t all wonderful). 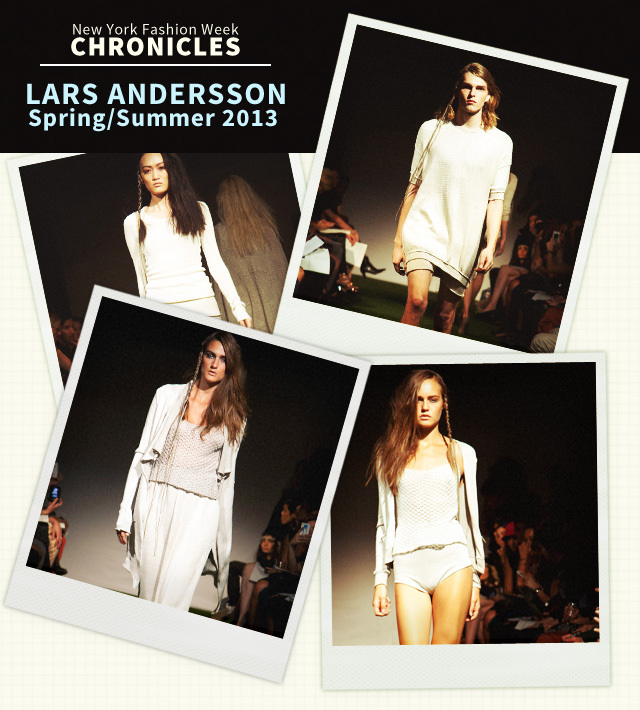 Backstage at Lars Andersson Spring 2013 New York Fashion Week Show. Courtesy Photo. There was quite a bit of Hole-era Courtney on display there, in no small part because the knits were nearly always sheer, and in the bright lights of the astro-turf lined tent, more than a few guests mentioned the model’s butts after the show. But the clothes were cleaner than Courtney, even though there were still threads of a grungy vibe. 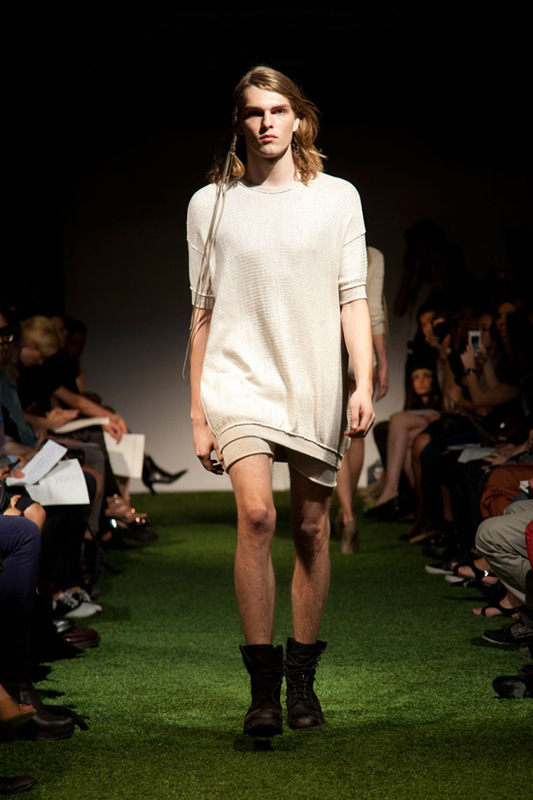 Lars sent a few men’s looks down the runway, too, though it’s hard to imagine cashmere boxer briefs catching on next summer. Big safety pins could be a thing, though, because you never know. “I think it’s the same customer, the same drama, just a shift in color,” said Andersson. Which is definitely true in retrospect–the clothes were as dramatic as ever, if a little blander for the monochrome ecru. And to that, Lars would probably say, “I don’t like to work with color. It’s a statement.” Well played, Andersson, well played.